Paris is mobilising political will to transition to Water-Wise Cities! 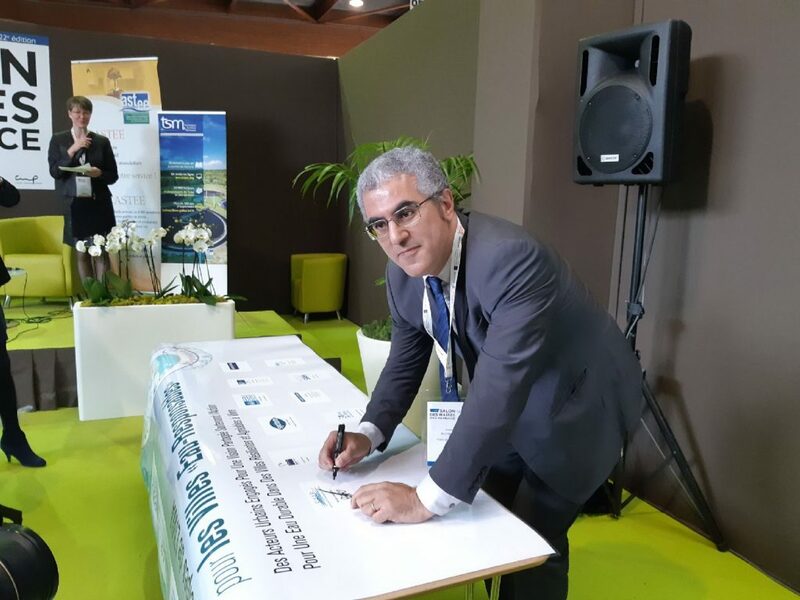 Since the launch of the IWA Principles for Water-Wise Cities at the 2016 World Water Congress and Exhibition in Brisbane, Queensland, Australia, cities all over the world have been signing on to the Water-Wise vision. On April 12, 2018, 13 urban stakeholders from across Ile-de-France, welcomed by IWA President, Diane d’Arras, and Carine Morin-Batut, Director General of Astee, came together to mobilise political will towards a water-wise world. Astee, IWA Governing Member from France, organized the event to rally urban water stakeholders along a common vision for change. Many key urban water leaders, including elected officials, signed on to the Principles for Water-Wise Cities, including The Greater Paris Sanitation Authority (SIAAP), Eau de Paris, Agence de l’Eau Seine-Normandie and the City of Paris. Paris is committed to sustainable urban growth, through addressing climate issues, resources management, urban biodiversity and, last but not least, good governance. Signing on to the Principles reinforces Paris’ transition towards integrated urban water planning, multiplying synergies across sectors. Be sure to follow what these stakeholders do next on their water-wise journey! Read about what other endorsing cities have done towards a water-wise world in their City Water Stories. Join us on the journey and endorse the Principles today!